This might be the only way that you are able to become the person that you are looking to become. When you develop negotiating skills it is easier to be more confident, assertive, motivated and achieve better working habits at home and at work as well. Think about the things that you want to become better at. 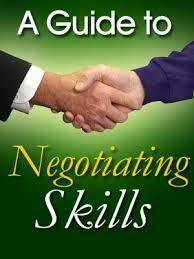 negotiating skills so that you are able to meet your personal and business goals. So buy the book and find ou you can improve your confidence in any negotiation.